A grenade is a small bomb. Functionally, its main difference from a firecracker is the grenade's fuze is lighted by a mechanical device rather than a match. In Korea, we used five different types depending on the objective. Our Mark deuce fragmentation grenades were very effective on defense since Chinese often used less deadly potato masher concussion grenades to protect their exposed troops. 5th RCT checks North Korean dead on Hill 268 at the beginning of our break-out from the Pusan Perimeter following our great victory at Inchon. Waegwan, South Korea, 21 September 1950. X Corps' 3rd Infantry Division in action against disorganized North Korean troops, but China was launching their ambush against both X Corps' Marines in Chosin and our too-hard-charging 8th Army. Near Haejung, North Korea, 11/27/50. We normally just hooked our grenades into our clothing by their spoons. The front soldier in the left has a Mark 2 hooked into his jacket just above his left hand, and the solder on the left of the right-hand group has a Mark 2 hooked into the top of his field jacket. The Chinese used stick grenades, and carried them in waist-pouches. 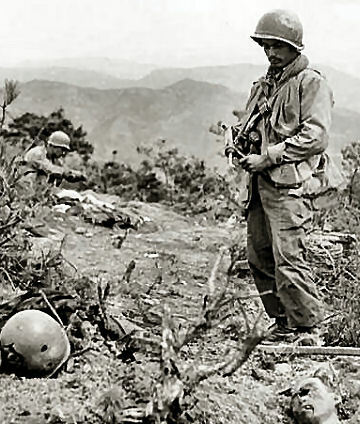 US forces in Korea used five basic types of hand grenades, many of which can easily be converted to rifle grenades. 1. Offensive grenades (pic, upper left). Contain an explosive charge filler of flaked TNT in a body with sheet metal ends and pressed fiber sides. Designed for demolition effect and to stun the enemy in enclosed places. An older model Mark I is shown above, but went to the Mark IIIA-1, about 14 ounces, for Korea. The earlier dangerous impact type fuse was replaced with a time fuse as with the fragmentation grenade. 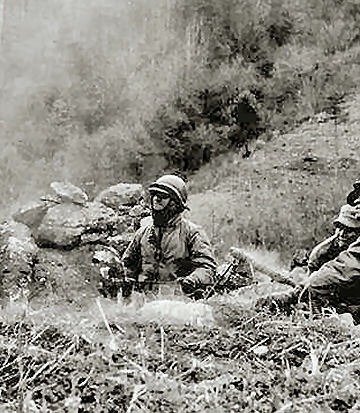 By 1953, our concussion grenades were simple half-pound blocks of C-3, an explosive resembling opaque yellow plastic, packed in cardboard, and into which was screwed the standard fragmentation timed fuze. 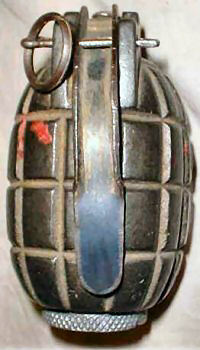 The fragmentation grenade was much more widely used in defensive situations. The Chinese and North Koreans frequently used concussion grenades as their primary grenades for assaults, as they pose less danger to attacking troops. However our soldiers would sometimes be stunned but still recover in time to continue fighting effectively. 2. 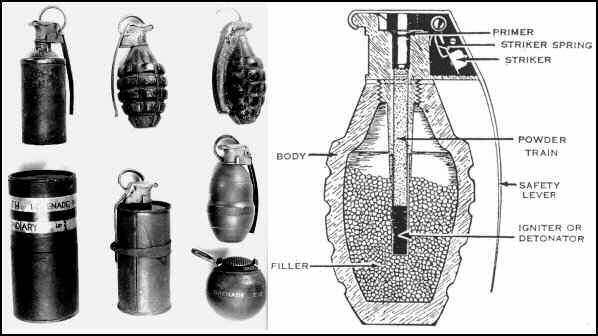 Fragmentation grenades (pic, upper middle). Contain an explosive charge in a metal body, designed to break into fragments upon the charge exploding. They have a killing radius of 5 to 10 yards, and fragments are dangerous up to 50 yards. Normally thrown less than 35 yards, that means 'duck' until they explode, and the time delay after pulling the safety pin was from 4.0 - 4.8 seconds. The MarkIIA1, fitted with the M10A3 fuse, was most commonly used. Weighing about 21 ounces, constructed of cast iron with serrations, this grenade produced about 1000 potentially lethal fragments. 3. Chemical grenades (pic, bottom row and middle right). Designed to produce a toxic or irritating effect, a casualty effect, a screening or signal smoke, an incendiary action, or some combination. 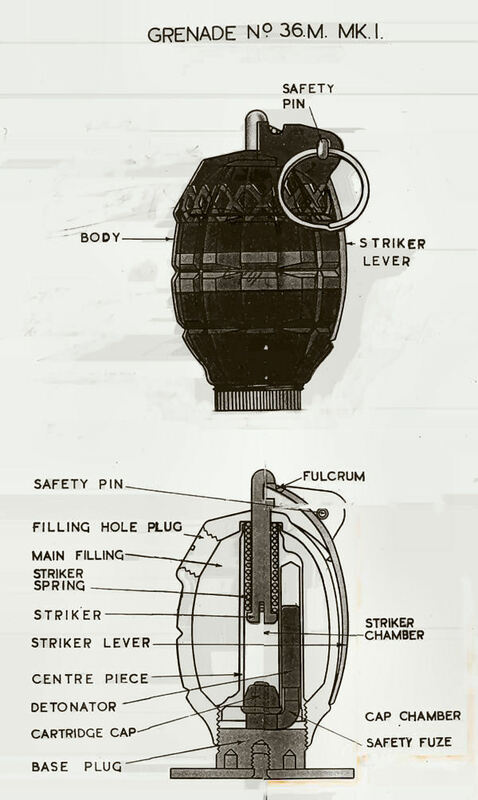 Some of these grenades, as with the TH M14 thermite (bottom center, and enlarged bottom left without fuze), come with metal straps which prevent rolling, and an M200A1 igniting fuse with only about 2 seconds of delay after safety lever release. Baseball-type tear gas grenades (bottom right) are special issue for riot control, using a CN filler. 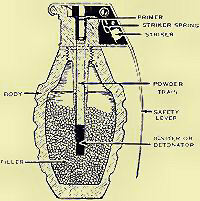 The most common chemical grenade was the M15 White Phosphorous. Weighing about 31 ounces, using the M6A3 fuse with a 4.0 - 4.8 second time delay, the M15 had a burst radius of about 25 yards and burned for 50 to 60 seconds. Officially intended as screening, casualty and harassment, the WP could illum a suspect area for the gunners while still giving any enemy in the area other things to worry about. The Mk1 (middle right) was an Illuminating grenade. 4. Practice grenades. Contain a reduced charge for safe use in training. 5. Training grenades (upper right). Containing no explosive charge or chemical, these are for grenade throwing practice. 6. 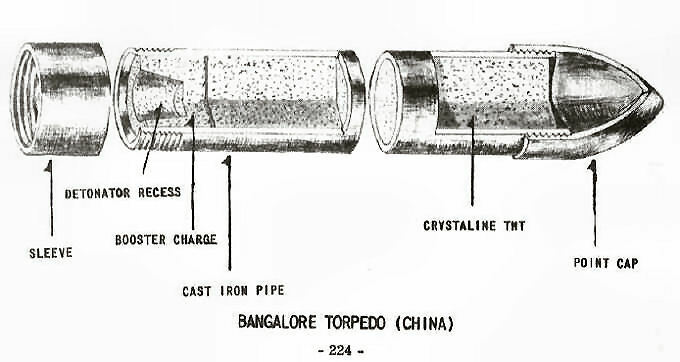 Bangalore Torpedo. As did Communist forces, we sometimes also used the bangalore torpedo. This is just a 3 foot or so length of pipe, filled with flaked TNT or plastic like C-3, and capped at both ends. The fuze is screwed into one end of the pipe. It is primarily intended to blow paths through obstacles like barbed wire, and so is normally inserted under them, with the blast effect blowing the obstacle material up and to the sides. Grenades come in different sizes and shapes, for different purposes, but all have two things in common. First, they are hollow so they can be filled with the explosive or chemical filler. Second, they contain a threaded hole into which a fuze can be screwed or inserted. A grenade is essentially a small bomb, but works very much like a simple firecracker. A firecracker is made up of a paper body filled with gunpowder and has a small fuze. When you light the fuse, it burns down to the powder and blows the paper body apart. A grenade works exactly the same way, the main essential difference being that the grenade's fuze is lighted by a mechanical device rather than a match. 1. Holding the grenade in the throwing hand, thumb over the safety lever, pull the safety pin (A cotter pin, bent at one end, ring attached to the other, pull force of 10-35 pounds. In immediate threat situations, the ring could be pulled enough to straighten the cotter pin, and then flipped out easily). 2. 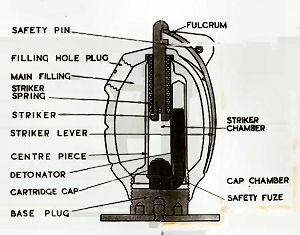 When the grenade is thrown (safety lever released), a spring throws off the safety lever and rotates the striker into the primer. 3. The primer contains material like the head of a match. When struck by the striker, it ignites and sets fire to the fuze, or powder train. The fuze burns at a controlled rate, providing a time delay (usu 4-5 seconds). When the flame of the fuze reaches the detonator or igniter, it causes action on the filler. 4. A detonator is similar to a small blasting cap. Very sensitive to heat, when the fuze burns into it, it causes the grenade to explode. 5. An igniter is a cap that burns rapidly. It basically sets fire to the filler causing a rapidly expanding gas which bursts the container. 6. The MarkII fragmentation grenade shown uses a detonator.